What makes our Honor Cords special? Our cords are hand made. Each end is knotted and finished with a brilliant, soft stranded tasse, giving it a fuller and thicker look. We have cords in any color desired. No quantity is to big, nor to small. A Single Universal Graduation Honor Cord lends distinction to the graduates by symbolizing and recognizing different special accomplishments during the education of the student. This is symbol of related to the calmness of the sky, honesty, stability, and trustworthiness. 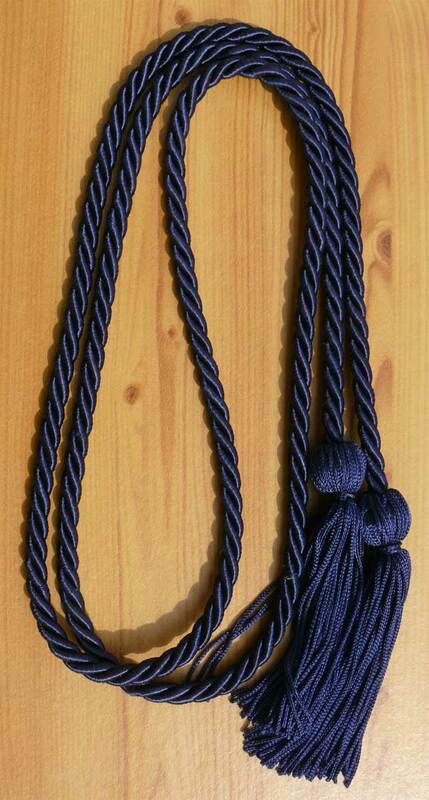 The gentle sheen makes this dark blue cord perfect for any graduation attire. The best part about these Navy Blue cords is not that they are exquisitely made, but that they are extremely affordable. If bought individually these cords run at only $5.99! Purchasing in bulk, however, will provide a savings from two dollars to an astounding four dollars depending on how many you want! Other single colors available include Black, Emerald/Kelly Green, Forest, Navy Blue, Maize, Old Gold, Lilac, Maroon, Orange, Pink, Purple, Red, Royal Blue, Silver, Sky Blue, Hot Pink, Turquoise, and White. Gold single cord. Customer Reviews on "Navy Blue Graduation Cords"
"Graduationproduct.com by far is the number one Graduation Honor Cords store. My experience with this order has been great. I appreciate the work that Graduationproduct.com do for their customers. I will refer graduationproduct.com for Honor Cords to all of my Friends, I am sure they'll share the same experience. " Write you own review on "Navy Blue Graduation Cords"